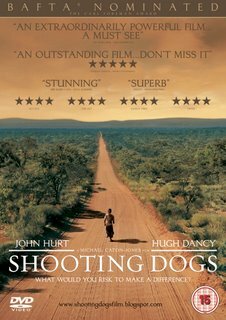 So in direct contrast to 300 - check out Shooting Dogs... a film about the 1994 Rwandian genocide. It is about the Catholic School that was the base for the UN and protected about 2500 Tutsi's from the massacre... that is until the UN was ordered to pull out... the priest of the school chose to stay - when his helper asked why - he said because God was among the suffering... WOW. The teacher left on the last truck. The priest gave his life to save some children - I'd say that was a good way to die. 'Sacrifice is the highest form of love' - the surviving girl says of the death of her priest in exchange for her life - now, to live well is a way to return the love. The time we have been given is a gift. We should use our lives well to return the great love that Christ showed us when He died in our place. It is like a way of returning love to the Father. Not a bad definition of true worship. The subtitle of this film asks the question, What would you risk to make a difference? I think that's a good question too.